BRI, located in Seattle, has extensive biorepository resources for the study of autoimmune disorders, with samples and patient histories dating back to 2000. 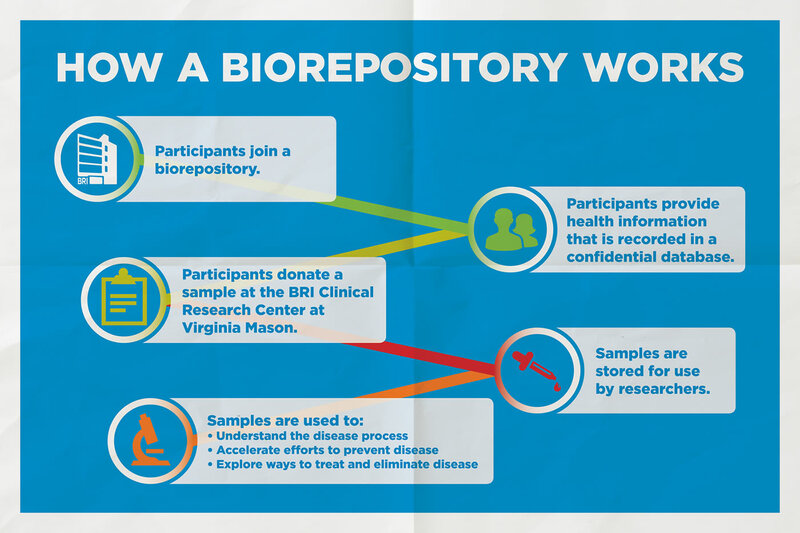 A biorepository or biobank consists of blood and serum samples and medical histories collected from volunteers with or without diseases. Donated samples and health information from people that do not have an immune-mediated or autoimmune disease are used by BRI scientists to better understand the causes and long term health effects of immune mediated diseases, as well as to explore better treatment options. Researchers are using the celiac disease biorepository to better understand the progression of this disease and identify targets for new therapies. Scientists are also investigating how genetic risk factors for celiac disease affect the immune system to cause disease. Scientists are involved in studying multiple aspects of the immune system and its relation to type 1 diabetes. While some research is conducted in models of diabetes, many researchers study human blood samples to gain a better understanding of the disease. Researchers are investigating the relationship between Down syndrome and autoimmune disease to better understand why patients with Down syndrome have increased risk of developing autoimmune diseases and in order to identify new treatment approaches for autoimmune diseases. Researchers are working to better understand the nature of the human immune response to bacterial, fungal and viral infections, which are the leading causes of mortality and morbidity worldwide. Researchers are working to learn how and why inflammatory bowel disease (IBD) develops, better understand the biomarkers associated with the progression of IBD and identify targets for new therapies. Scientists are working to better understand the nature of multiple sclerosis (MS) disease initiation and progression to better target therapy. BRI scientists recently discovered novel biomarkers of MS that can be used to gauge disease activity and as a target for new therapies. Researchers are studying the molecular and genetic profiles of people with rheumatic diseases compared to healthy people to better understand the disease mechanisms at onset and investigate possible environmental factors that could contribute to the diseases.